Spitfires Mk. IX of No. 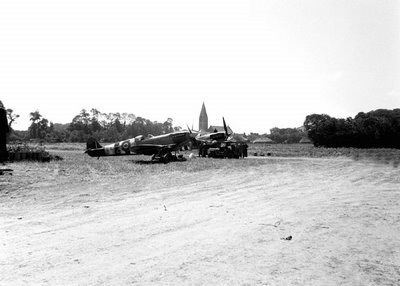 412 Squadron at field base B4 near Bény-sur-Mer, shortly after D-Day. Bény-sur-Mer was one of the first landing grounds being prepared at the beachhead, being captured already on the day of the landings after hard fightings in the Canadian sector. Two days later, maintenance and construction commando squadrons arrived in Normandy to build airstrips. Thus No. 412 Squadron RCAF moved to French soil within days of the landings. Air superiority patrols was the unit’s main task until the breakout in August, after which a move to Northern France brought operations over Nijmegen and Arnhem.